ResidentDante: I wouldn't go for a holiday here! I wouldn't go for a holiday here! 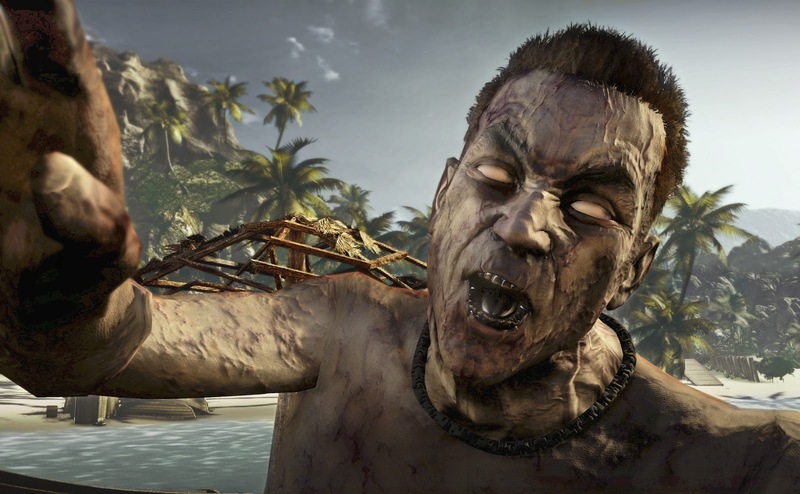 Dead Island is a difficult game to review. 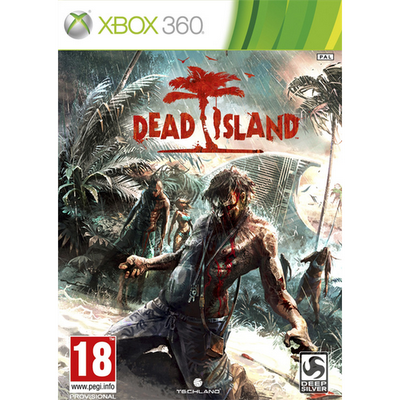 It contains a lot of great ideas, a brand new concept and some great gameplay moments. Sadly it also falls short in other parts. DI is a cross between a FPS melee fighting game and a RPG all combined into a sandbox structure. Sounds confusing? Well yes it is, but get this: The game is seen from an FPS view, it mainly revolves around melee weapons and lets you build up experience points to level up your character. The game world is very open and you can choose either to play the main missions or go around and look for side ones. All this is explained easily in the first hour and quickly lets you explore by yourself. The story puts you in the character of one of four people waking up after a night of heavy drinking at a resort hotel on an island. Only to find out a zombie virus has spread lose and everyone is roaming half-dead around. It sounds absurd and is even more so when watching the incredibly cheesy and almost laughably bad intro-movie. You can modify weapons in numerous ways. Gameplay, unlike the story, picks up fast and you get the idea that this is where the main production of the game has been spent. 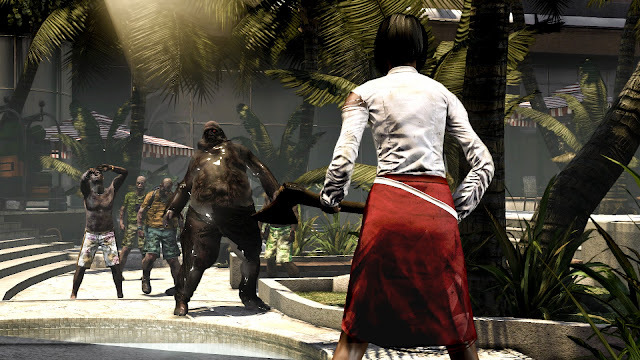 While difficult at the beginning, the melee fighting and techniques for breaking arms and legs and finally killing the zombies are learnt fairly fast. The combat is actually quite satisfying. The game relies heavily on melee, guns are introduced far later in the game and actually aren't very effective (actually the gunplay is rather bad) and requires you to either upgrade hand-weapons, create new ones or switch them out with unused ones. 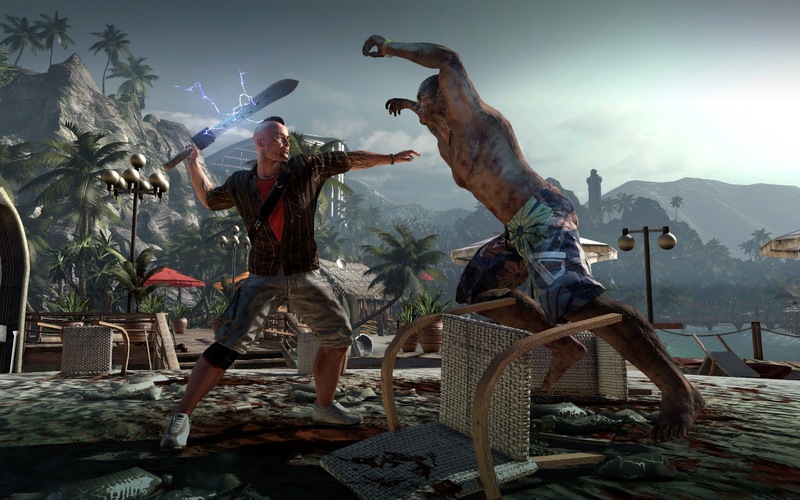 All melee weapons take damage from extended use, thus resulting in the need for maintenance or swapping out. You can even switch to a manual mode for melee in the options, where you actually control the swing of your arms, but this is very tricky to control. Situations like this can become very nasty! The game has some really amazing scenery at times. The combination of wear and tear on weapons with the levelling system works surprisingly well, I thought it would be annoying, but in reality it’s enjoyable. There’s a great satisfaction when levelling up and using them on desired abilities. In fact without this RPG element DI would have been a far duller game. It gives purpose to the endless zombie slaying and a feeling of getting stronger along the way. The only minor complaint here is the difficulty level when playing alone, you die a lot, there’s an instant respawn but it feels strange to constantly get a new chance in single player. Luckily the pace of the zombies are slow (take that, annoying and stressful Left 4 Dead! ), so you can often retreat and try to attack in another way. Inside buildings though, it gets a lot harder to avoid being surrounded and cornered. Location wise DI is varied, ranging from the tropical beaches at the beginning, to favela-like slums and rainforest jungles, finally ending up at a jail (the fourth and utterly disappointing location). 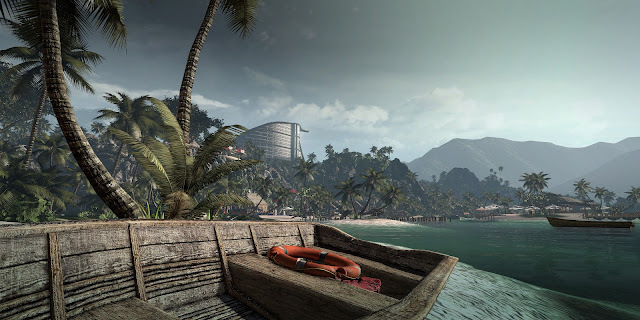 The slums are a little too much trekking in sewers for my liking, but the opening level starting in a hotel and moving on to a beach really take the crown. They look wonderful, are very large and beg to be explored. The feeling of trying to get into buildings while constantly checking over your shoulder for some fast, screaming zombie jumping at you really gives a sense of survival. In fact the parts you are truly alone are the best, in a sense contradicting to the clearly co-op centred idea this game is meant for. 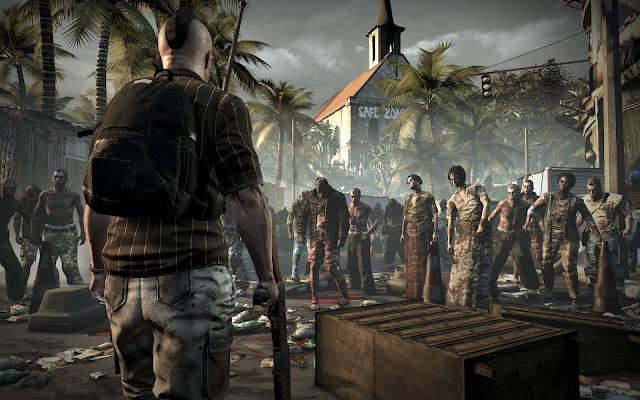 Even though the tropical location may look like a colourful and nice place, the game actually manages to scare witht eh feeling thath you are actually in a world where zombies have taken over. Though mainly ordinary zombies, there are a few special ones. DI is really a co-op four player game, but is fine to play yourself. However they seem to have forgotten to add a proper storyline along the way and focused mainly on just making a fairly linear game. The cutscenes are beyond terrible, with careless voice-acting (though never near how cheesy a lot of Japanese games are) and you simply end up skipping the talking. It’s just a gang of four (even though you play alone they all appear in the cutscenes for some reason) idiots with stupid remarks and ideas of surviving. This lack of story and good cinematics game really hurts the game after the first area where you are still getting the hang of the ropes gameplay wise. Once this settles you crave more, and you never get it. In fact the game then starts to show its true colours of being cheaply made. Annoying gameplay issues, repetitiveness and simply meaningless side-quests only really inspired by the earning of XP just doesn't cut it in the end. Even more so when the game introduces some truly terrible gunfights against rebelling humans (yup, that’s humans not zombies). 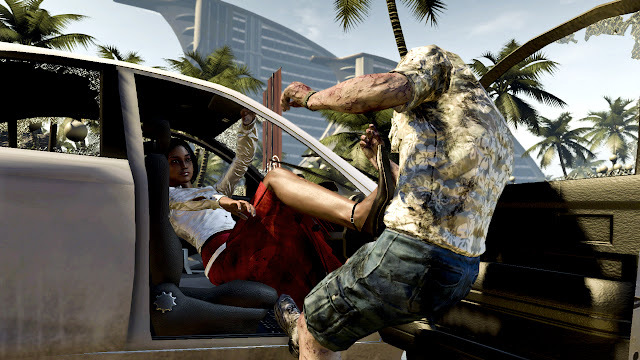 Apart from the first part of the game and the generally fun parts where you’re trying to find out how to survive (collecting car parts to drive, food and drink etc.) the game really falls short after this. It only slightly relights the entertainment value when you reach a research facility, but this ends up being disappointing story wise as well. There are large amounts of potential in the idea of the game. Technically the game engine in particular makes the game look really good sometimes and handles large as well as claustrophobic indoors environments very well. But even graphically the game ranges from very good looking to extremely bland and downright ugly. The first area could almost reach an 8/10 for me, the later ones fall far below and the ending is terrible. DI could really do with a spectacular sequel where a story and high quality cutscenes are added, gameplay feeling and flow tweaked (it often feels a little buggy and sluggish) and a far more inspired environment design. It needs more variation, better level design and generally a sense of being a more finished product. That said, I loved the first part of the game. It felt like waking up in a zombie movie, and it felt exciting looking for food, supplies and generally keeping an eye for yourself while zombies lurk at each corner. I liked the drastic change from a bright outdoors to a creepy and tense indoor atmosphere. Sadly though the game doesn't have what it takes to keep you interested and feels very uninspired from then on. Reckon you can handle this kingdom?